"He stood there, watching that awful fog billow and surge. It was bad. By God, it was real bad. But Gosling was almost glad it was there, hiding things, masking others. For if it cleared, he was almost afraid of what they might see out there. And what might see them." 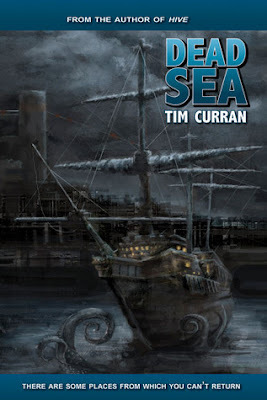 This is my first book by Tim Curran - after this terrifying voyage on the sea, I'll definitely give more of his stuff a try and hope those books are as potent. He writes beautifully, drawing out the pacing when the tension is thick by shortening his lines and dishing out almost poetic prose while his dialogue is convincing and genuine. Besides the storyline holding genuine thrills and chills, it's amped up with intelligence. Not only horror, but the confusing melds of physics and wormholes and other dimensions. The ending especially injects healthy doses of science fiction to sail it though. What caught me in for a bigger hook was the exploration of sea lore. There's so many stories about voyages on the water gone bad - from sea monsters and sea legends, to disappearing vessels and ghost ships. You have sirens and weeds and mutinies, monsters and squids and all the hidden horrors of the sea exposed. Plenty of frightening source material to draw upon, and Curran went all out on delivering here, to the point to where it was almost overload. It's rare for me to feel a chill reading a book or watching a movie - but in this case, I definitely felt it. My list of genuinely creepy novels is short, and usually those only make the list because of one or two short scenes. Not the case here. The book is rich in tension, that fog is outright creepy because - like playing on the effect of something creepy happening in the dark - it's creepy because the fog keeps the mystery high. You can't see what's more than a few feet in front of you, you can only hear it, imagine it, and fight it when it's suddenly there. The monsters are mean and the monsters are many. They're well-conceived, nasty creations; brutal and merciless and gory. There's even a weird scene with an extraterrestrial and at first I thought it would be an ironic commentary that this creature is encountering man as another new, hostile monster to overcome in the sickening sea world...but the author turned it instead to where it is another hostile force our group of men must reckon with if they want to survive. A worthy grouping of characters who complement and contrast. When they're not battling the sea and all the monsters within, they're battling each other. 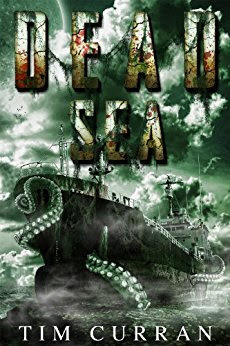 The survivors are divided into two groups for most of the book, and each of those groups must survive sanity over the odds....it's not helped that some of them don't get along. Testosterone taints the air as thickly as the fog at times. This brings a realistic twist we all would recognize in people in a world we wouldn't. 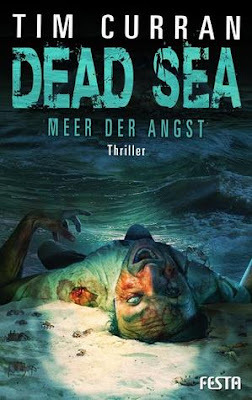 Dead Sea is an epic horror novel, although it's not 100% perfect because sometimes it's a little drawn out and redundant. Despite the length being a little too drawn out, pacing is kept up well for the slowly dawning horror that affects the group. 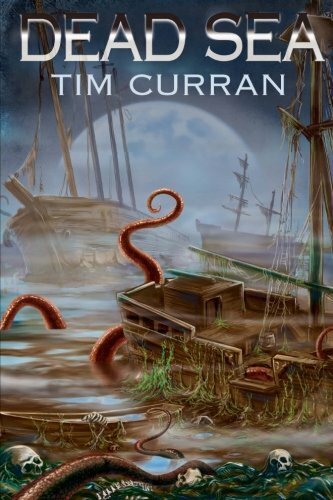 It's delightfully claustrophobic and reminiscent of Lovecraftian lore, a lengthy voyage into a genuinely chilly, fog-drenched horror novel that all fans should experience. "And if you listened very closely you would hear the blood rushing through its veins and the hum of its nerve endings, a distant rushing sound like respiration. The sound of the fog breathing."